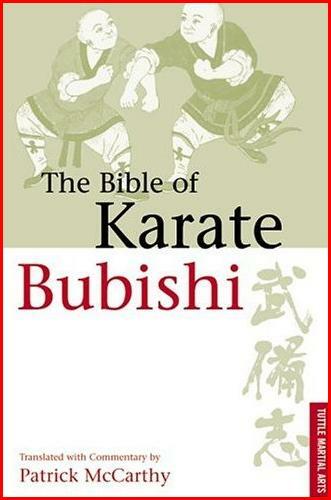 Bible of Karate: Bubishi translated by Patrick McCarthy is an indispensable volume for the avid Budo-ka and is the orignal text from where The International Budo Institute named its in house style: Bubishido. A novice to Karate-do might do well to put off getting this volume until a more stable grounding in the art in attained. It contains no detailed explanation of technique but the section on the history and philosophy alone would make buying this book more than worth it’s price. Those practicing Goju-ryu, Isshin-ryu, Kyokushinkai or Shorinjiryu varieties of Karate-do will find the origins of Kata, such as Sanchin and Seisan, given here most interesting. However, all person’s interested in Budo will find something in this book about the immensely historical text known as the Bubishi. The Bible of Karate: Bubishi contains the descriptions of Chinese medicine, vital point striking, and strategy that informed the techniques of the Okinawan Masters. In and of themselves these explanations are inadequate introductions to these subjects. But that together as a book, that it became a volume treasured by the Okinawan Masters is of immense importance in that it give us helpful clues to the subjects these Karate-ka concerned themselves with and which they felt to be of vital importance to the advancement of their technique.